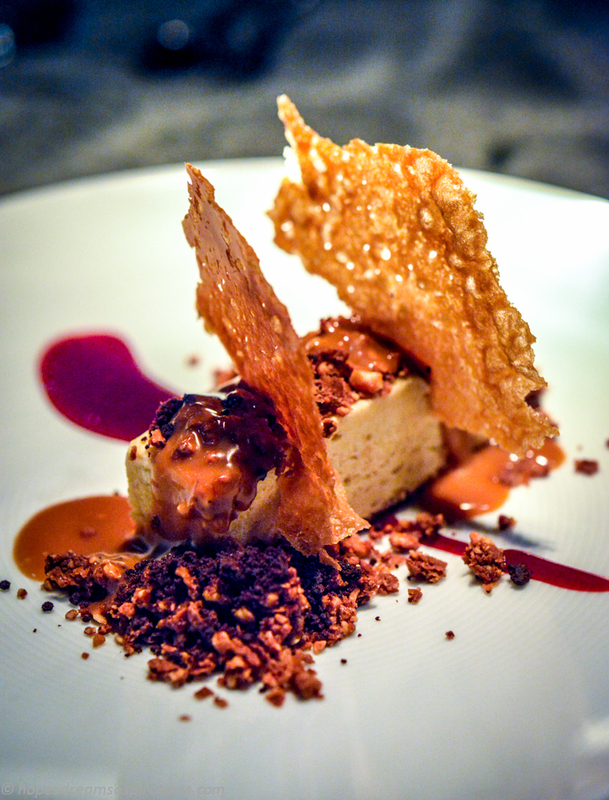 Having had the most amazing dessert at The Sugar Club, I set about recreating this dish. Turns out it isn’t as difficult as I imagined it to be, albeit slightly simplified. The flavours and textures are all present though. The parfait recipe here is an adapted version of Geoff Scott’s (Vinnie’s) and the Cordon Bleu cookbook. It doesn’t contain gelatine and I will make another one later that uses gelatine to test the difference. The rest of the elements are things I make quite often for my macarons, cakes and entremets. So while it may seem like a long list, there are often at least 1 or 2 elements readily made in my fridge at any time. I encourage you to follow suit in case of dessert emergencies. Lightly whip the cream until soft peak stage. Set aside. (I do this step first as I only have 1 bowl for my mixer. If you have alternate means, do this step after step 3 below). Place sugar and water and in a saucepan and bring to the boil. Cook for 7-10 minutes until it reaches the soft boil stage at 118°C on a thermometer. While the sugar syrup is coming up to temperature, whisk the yolks and vanilla paste with an electric beater until pale and thick, continue whisking and slowly pour the hot sugar syrup in a trickle down the side of the bowl (like making Italian meringue). Whisk till it has cooled, about 6 minutes. The mix should be thick and aerated. Mix in the peanut butter paste. Take a third of the cream and gently fold into the yolk mix. Add the remaining cream and gently fold through. This step is crucial, do it gently to maintain the lightness in the mixture. Line a large loaf or square pan with greaseproof paper then pour in the mix. Freeze overnight. Tip out onto a board and remove paper. Pre slice into thick slices and keep in the freezer until ready to serve. Tip: I found it hard to cut through a deep solid block. Using a square pan would help as the parfait would not be as high as it would reach if it was in a loaf pan. Far easier to cut neat rectangular slices out this way. Melt chocolate over a pan of simmering hot water. Add feuilletine, stir to mix and pour in a baking paper-lined tray. Cool in fridge. In a large heavy saucepan, melt the butter and add rest of ingredients. Stirring constantly, bring to a boil over medium high heat till it reaches 118C at the soft ball stage. Pour half into a jar for another time or onto a baking -paper lined tray to make toffee squares, like the Mckintosh Toffees. Add cream to the remaining butterscotch toffee in the pan and stir till it becomes homogenous. Pour into jar to cool. Put a dollop of the salted caramel near the top of the plate, off centre. In a quick motion, “schmear” it straight down or across confidently. Place a piece of the parfait on the schmear. Scatter over the chocolate feuilletine crumb and pour the butterscotch sauce over.